Recognition of pyogenic granuloma as a clinically polypoid or exophytic circumscribed lesion is of importance to the clinician and pathologist because this feature distinguishes pyogenic granulomas from most malignant vascular tumors. 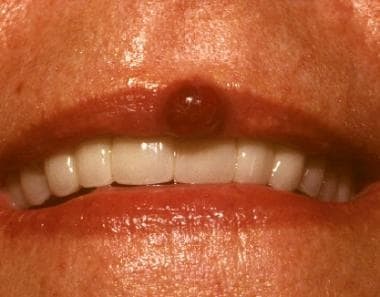 Although pyogenic granulomas may be multiple (especially on the skin) and necrosis is common, invasion of adjacent structures is not observed. The lesions grow rapidly and are extremely vascular, frequently bleeding either spontaneously or after minor trauma. They are usually easily treated with surgical removal but may recur. Uncommon variants include pyogenic granuloma with satellitosis, [5, 6, 7] intravenous pyogenic granulomas,  subcutaneous pyogenic granulomas, [9, 10] and eruptive pyogenic granulomas. [11, 12, 13] Satellite lesions of smaller pyogenic granulomas may develop at the same time as the primary lesion or may occur after attempted treatment of the primary lesion. See the images below. Pyogenic granulomas are usually solitary lesions. The fingers and hands are common locations for these to develop. A history of minor trauma at the site shortly before development of the lesion is frequent. Pyogenic granulomas usually bleed with little or no trauma. This patient shows a positive bandage sign. 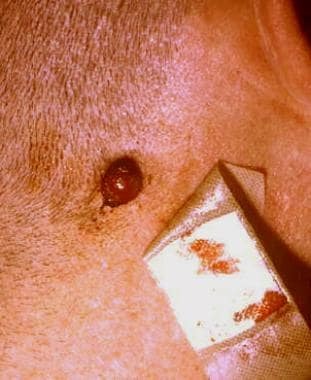 Because the lesions bleed so easily, patients frequently present with a bandage covering the site. Pyogenic granulomas usually have a distinct margin that consists of a rim of keratin (dry skin). Notice the moist area of skin produced by the bandage, which was removed shortly before the photograph was taken. Pyogenic granulomas may be pedunculated and quite large. An area of necrosis is also common. 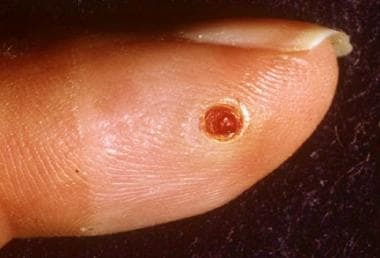 Pyogenic granulomas may occur at various sites. More than 60% of all lesions develop on the head and neck. Although most patients (74.2%) do not have a history of trauma or predisposing dermatologic conditions, in many cases, a history of recent trauma at the site is present. Large numbers of lesions may occur following damage to diffuse areas skin by burns or other trauma. [14, 15] A nitric oxide synthase–dependent mechanism is thought to contribute to angiogenesis and the rapid growth of pyogenic granulomas (PGs). They are benign vascular proliferations, but the specific pathophysiology of these lesions is unknown. Originally, pyogenic granulomas (PGs) were thought to be caused by bacterial infection; the etiology has yet to be determined. Postulated etiologies include viral, hormonal, and, more recently, angiogenic factors. Pyogenic granulomas have been evaluated for the presence of human papillomavirus (HPV) because warts occur in similar age groups and sites. Lesions were tested for HPV 6, 11, 16, 31, 33, 35, 42, and 58. No viruses were present. Recurrent pyogenic granuloma with satellitosis is an uncommon variant. In one patient with recurrent pyogenic granuloma with satellitosis, Warthin-Starry staining of the lesions revealed clumps of dark bacilli as found in patients with bacillary angiomatosis. An indirect immunofluorescence assay showed elevated immunoglobulin G antibodies against Bartonella (Rochalimaea) henselae. The patient did not present an obvious risk for human immunodeficiency virus (HIV) infection or immunosuppression; no antibodies against HIV-1 and HIV-2 were found. Recurrent pyogenic granulomas with satellitosis may be a localized variant of bacillary angiomatosis. Pyogenic granulomas (PGs) account for 0.5% of skin lesions in infants and children and are also found in the oral mucosa in 2% of pregnant women. No substantial difference in incidence is found between races. One study of 178 patients younger than 17 years reported the male-to-female ratio as 3:2. In adults, pyogenic granulomas are more common in females because of pregnancy-related lesions. Requena L, Sangueza OP. Cutaneous vascular proliferation. Part II. Hyperplasias and benign neoplasms. J Am Acad Dermatol. 1997 Dec. 37(6):887-919; quiz 920-2. [Medline]. Weibel L. Vascular anomalies in children. Vasa. 2011 Nov. 40(6):439-47. [Medline]. Rachappa MM, Triveni MN. Capillary hemangioma or pyogenic granuloma: A diagnostic dilemma. Contemp Clin Dent. 2010 Apr. 1(2):119-22. [Medline]. [Full Text]. Singh RK, Kaushal A, Kumar R, Pandey RK. Profusely bleeding oral pyogenic granuloma in a teenage girl. BMJ Case Rep. 2013 Mar 12. 2013:[Medline]. Itin PH, Fluckiger R, Zbinden R, Frei R. Recurrent pyogenic granuloma with satellitosis--a localized variant of bacillary angiomatosis?. Dermatology. 1994. 189(4):409-12. [Medline]. Le Meur Y, Bedane C, Clavere P, et al. A proliferative vascular tumour of the skin in a kidney-transplant recipient (recurrent pyogenic granuloma with satellitosis). Nephrol Dial Transplant. 1997 Jun. 12(6):1271-3. [Medline]. [Full Text]. Taira JW, Hill TL, Everett MA. Lobular capillary hemangioma (pyogenic granuloma) with satellitosis. J Am Acad Dermatol. 1992 Aug. 27(2 Pt 2):297-300. [Medline]. Saad RW, Sau P, Mulvaney MP, James WD. Intravenous pyogenic granuloma. Int J Dermatol. 1993 Feb. 32(2):130-2. [Medline]. Fortna RR, Junkins-Hopkins JM. A case of lobular capillary hemangioma (pyogenic granuloma), localized to the subcutaneous tissue, and a review of the literature. Am J Dermatopathol. 2007 Aug. 29(4):408-11. [Medline]. Park YH, Houh D, Houh W. Subcutaneous and superficial granuloma pyogenicum. Int J Dermatol. 1996 Mar. 35(3):205-6. [Medline]. Shah M, Kingston TP, Cotterill JA. Eruptive pyogenic granulomas: a successfully treated patient and review of the literature. Br J Dermatol. 1995 Nov. 133(5):795-6. [Medline]. Strohal R, Gillitzer R, Zonzits E, Stingl G. Localized vs generalized pyogenic granuloma. A clinicopathologic study. Arch Dermatol. 1991 Jun. 127(6):856-61. [Medline]. Ximenes M, Triches TC, Cardoso M, Bolan M. Pyogenic granuloma on the tongue: a pediatric case report. Gen Dent. 2013 Aug. 61(5):27-9. [Medline]. Momeni AZ, Enshaieh S, Sodifi M, Aminjawaheri M. Multiple giant disseminated pyogenic granuloma in three patients burned by boiling milk. Int J Dermatol. 1995 Oct. 34(10):707-10. [Medline]. Palmero ML, Pope E. Eruptive pyogenic granulomas developing after drug hypersensitivity reaction. J Am Acad Dermatol. 2009 May. 60(5):855-7. [Medline]. Patrice SJ, Wiss K, Mulliken JB. Pyogenic granuloma (lobular capillary hemangioma): a clinicopathologic study of 178 cases. Pediatr Dermatol. 1991 Dec. 8(4):267-76. [Medline]. Pagliai KA, Cohen BA. 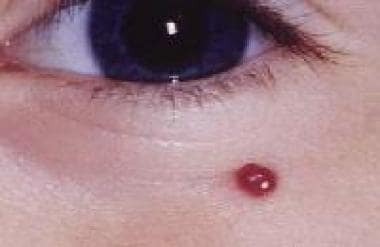 Pyogenic granuloma in children. Pediatr Dermatol. 2004 Jan-Feb. 21(1):10-3. [Medline]. Hasanoglu Erbasar GN, Senguven B, Gultekin SE, Cetiner S. Management of a Recurrent Pyogenic Granuloma of the Hard Palate with Diode Laser: A Case Report. J Lasers Med Sci. 2016 Winter. 7 (1):56-61. [Medline]. Truschnegg A, Acham S, Kqiku L, Beham A, Jakse N. CO2 Laser Excision of a Pyogenic Granuloma Associated with Dental Implants: A Case Report and Review of the Literature. Photomed Laser Surg. 2016 Sep. 34 (9):425-31. [Medline]. Kumar G, Rehman F, Chaturvedy V. Soft Tissue Applications of Er,Cr:YSGG Laser in Pediatric Dentistry. Int J Clin Pediatr Dent. 2017. 10(2):188-192. [Medline]. Quitkin HM, Rosenwasser MP, Strauch RJ. The efficacy of silver nitrate cauterization for pyogenic granuloma of the hand. J Hand Surg Am. 2003 May. 28 (3):435-8. [Medline]. Wang PH, Chao HT, Lee WL, et al. Severe bleeding from a pregnancy tumor. A case report. J Reprod Med. 1997 Jun. 42(6):359-62. [Medline]. Jafarzadeh H, Sanatkhani M, Mohtasham N. Oral pyogenic granuloma: a review. J Oral Sci. 2006 Dec. 48(4):167-75. [Medline]. Epivatianos A, Antoniades D, Zaraboukas T, et al. Pyogenic granuloma of the oral cavity: comparative study of its clinicopathological and immunohistochemical features. Pathol Int. 2005 Jul. 55(7):391-7. [Medline]. Sills ES, Zegarelli DJ, Hoschander MM, Strider WE. Clinical diagnosis and management of hormonally responsive oral pregnancy tumor (pyogenic granuloma). J Reprod Med. 1996 Jul. 41(7):467-70. [Medline]. Silverstein LH, Burton CH Jr, Garnick JJ, Singh BB. The late development of oral pyogenic granuloma as a complication of pregnancy: a case report. Compend Contin Educ Dent. 1996 Feb. 17(2):192-8; quiz 200. [Medline]. Smulian JC, Rodis JF, Campbell WA, et al. Non-oral pyogenic granuloma in pregnancy: a report of two cases. Obstet Gynecol. 1994 Oct. 84(4 Pt 2):672-4. [Medline]. Saravana GH. Oral pyogenic granuloma: a review of 137 cases. Br J Oral Maxillofac Surg. 2009 Jun. 47(4):318-9. [Medline]. Kapadia SB, Heffner DK. Pitfalls in the histopathologic diagnosis of pyogenic granuloma. Eur Arch Otorhinolaryngol. 1992. 249(4):195-200. [Medline]. Dictor M, Bendsoe N, Runke S, Witte M. Major basement membrane components in Kaposi's sarcoma, angiosarcoma and benign vascular neogenesis. J Cutan Pathol. 1995 Oct. 22(5):435-41. [Medline]. Wine Lee L, Goff KL, Lam JM, Low DW, Yan AC, Castelo-Soccio L. Treatment of pediatric pyogenic granulomas using β-adrenergic receptor antagonists. Pediatr Dermatol. 2014 Mar-Apr. 31 (2):203-7. [Medline]. Patrizi A, Gurioli C, Dika E. Pyogenic granulomas in childhood: New treatment modalities. Dermatol Ther. 2015 Sep-Oct. 28 (5):332. [Medline]. Khorsand K, Maier M, Brandling-Bennett HA. Pyogenic granuloma in a 5-month-old treated with topical timolol. Pediatr Dermatol. 2015 Jan-Feb. 32 (1):150-1. [Medline]. Oke I, Alkharashi M, Petersen RA, Ashenberg A, Shah AS. Treatment of Ocular Pyogenic Granuloma With Topical Timolol. JAMA Ophthalmol. 2017 Apr 1. 135 (4):383-385. [Medline]. Knöpfel N, Escudero-Góngora MDM, Bauzà A, Martín-Santiago A. Timolol for the treatment of pyogenic granuloma (PG) in children. J Am Acad Dermatol. 2016 Sep. 75 (3):e105-e106. [Medline]. Neri I, Baraldi C, Balestri R, Piraccini BM, Patrizi A. Topical 1% propranolol ointment with occlusion in treatment of pyogenic granulomas: An open-label study in 22 children. Pediatr Dermatol. 2018 Jan. 35 (1):117-120. [Medline]. Cantisani C, Paolino G, Corsetti P, Bottoni U, Didona D, Calvieri S. Evaluation of Ingenol mebutate efficacy for the treatment of actinic keratosis with Antera 3D camera. Eur Rev Med Pharmacol Sci. 2015 Jan. 19 (1):92-7. [Medline]. Jung HJ, Eun DH, Kim JY, Lee WJ, Kim DW, Lee SJ, et al. Treatment of paediatric facial pyogenic granuloma with topical ingenol mebutate. Clin Exp Dermatol. 2017 Dec. 42 (8):912-913. [Medline]. Lee J, Sinno H, Tahiri Y, Gilardino MS. Treatment options for cutaneous pyogenic granulomas: a review. J Plast Reconstr Aesthet Surg. 2011 Sep. 64 (9):1216-20. [Medline]. Tritton SM, Smith S, Wong LC, Zagarella S, Fischer G. Pyogenic granuloma in ten children treated with topical imiquimod. Pediatr Dermatol. 2009 May-Jun. 26 (3):269-72. [Medline]. Musumeci ML, Lacarrubba F, Anfuso R, Li Calzi M, Micali G. Two pediatric cases of pyogenic granuloma treated with imiquimod 5% cream: combined clinical and dermatoscopic evaluation and review of the literature. G Ital Dermatol Venereol. 2013 Feb. 148 (1):147-52. [Medline]. McCuaig CC, Dubois J, Powell J, Belleville C, David M, Rousseau E, et al. A phase II, open-label study of the efficacy and safety of imiquimod in the treatment of superficial and mixed infantile hemangioma. Pediatr Dermatol. 2009 Mar-Apr. 26 (2):203-12. [Medline]. Giblin AV, Clover AJ, Athanassopoulos A, Budny PG. Pyogenic granuloma - the quest for optimum treatment: audit of treatment of 408 cases. J Plast Reconstr Aesthet Surg. 2007. 60 (9):1030-5. [Medline]. Akbulut N, Kursun ES, Tumer MK, Kamburoglu K, Gulsen U. Is the 810-nm diode laser the best choice in oral soft tissue therapy?. Eur J Dent. 2013 Apr. 7 (2):207-11. [Medline]. Azma E, Safavi N. Diode laser application in soft tissue oral surgery. J Lasers Med Sci. 2013 Fall. 4 (4):206-11. [Medline]. Dollery W. Towards evidence based emergency medicine: best BETs from the Manchester Royal Infirmary. Curettage or silver nitrate for pyogenic granulomas on the hand. J Accid Emerg Med. 1999 Mar. 16 (2):140-1. [Medline]. Unlike pyogenic granulomas, cherry angiomas such as these are slow to develop, do not bleed easily, are frequently multiple, are more commonly found on the trunk, and seldom have a history of prior trauma. Several malignant tumors may mimic pyogenic granulomas. This lesion is a squamous cell carcinoma. Amelanotic melanomas (little or no overt pigment) are also included in the differential diagnosis. These tumors are usually slower growing than pyogenic granulomas and are uncommon in children. Tissue removed as part of the treatment process should be sent for histopathologic examination to confirm the diagnosis. Histologic image showing epidermal erosion and crusting, thinned epidermis, vascular proliferation, and mixed inflammation with lymphocytes, histiocytes, and neutrophils. Courtesy of Medscape Dermatology.